With the hikes on this list, you can’t go wrong – chosen for their fascinating diversity, they offer something different, spectacular and unique. Pick the hikes that suit your level, rent a car and set off to the spectacular fjord landscape. The memories you create will last a lifetime. Surrounded by the unforgettable fjord landscape, each of these hikes can be shaped to become your own personal treasure. You will find yourself in the untamed mountains and the wild coastal landscapes that were once the home of the Viking kings. Watching these natural wonders on TV or on social media simply does not compare to the experience of being there in person. A picture doesn't reveal the scent of the pine forest on the hike to the mighty Langfossen waterfall, or the feeling of standing at the edge of the abyss at Trolltunga or Preikestolen. Drive from hike to hike along the beautiful National Scenic Routes in Ryfylke and Jæren, and be sure to stop in some of the lovely little villages where you can enrich your taste buds with local delicacies. If you value peace and quiet on your hiking trips, it is wise to go in late spring or early autumn rather than during the high season in June, July and August – the most famous attractions like Trolltunga, Preikestolen and Kjerag tend to get a bit crowded at the weekends during summer. If you plan to do any of these hikes in the winter, please book a guide. Until recently, Trolltunga (the Troll’s Tongue) was a little-known attraction visited by just a handful of hardened mountain trekkers. 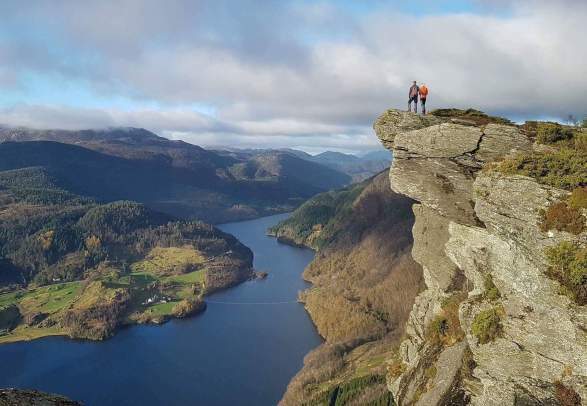 Now the whole world knows about it – the granite cliff that sticks out of the mountain like a tongue around 700 metres above Ringedalsvatnet lake has become one of the most photographed places in the world. The trail to Trolltunga is long and demanding, however. Many people dream of standing at the top with their arms raised in a triumphant V, but it takes a lot of hard work and determination to get there, and only a few hikers actually do it. And perhaps this explains Trolltunga’s appeal: You need a burning desire to see the cliff. Make sure you have a safe hike to Trolltunga. After conquering Trolltunga, you have the perfect opportunity to stop by the Langfossen waterfall, located just off the E134. You can also sample traditional Norwegian cuisine and book a fjord cruise on the gorgeous Åkrafjord. The sheer force of the 612-metre-high Langfossen waterfall in Åkrafjorden is spellbinding. No wonder that the CNN has listed this quintessential Norwegian waterfall as one of the ten most beautiful in the world. The best way to experience Langfossen is to follow the hiking trail on smooth granite, surrounded by thick pines and crooked birch trees. Calling the trail anything but steep would be pure fabrication, but the reward is an even more stunning view with every step. You will glance over the treetops at the fjord and the mountains while the waterfall roars in the distance. Sore and stiff calves will pass in a few days, but the memories of the magical views from Langfossen will last a lifetime. If you head west from Langfossen, the road leads to the idyllic city of Haugesund by the sea. You can also visit Vikinggården (the Viking Farm) at Karmøy, just outside Haugesund. Situated a relatively modest 357 metres above sea level, the Himakånå rock formation has become known as “Little Trolltunga”. Whilst it is easier to get to than Trolltunga, the views are equally impressive. For generations, no one gave Himakånå a second thought, but in 2016 and 2017 the number of visitors rose as steeply as the path to the top of the cliff. Compared to Trolltunga, the trek to Himakånå is faster, more accessible, and family friendly. Tucked away in a corner of the municipality of Tysvær, the surrounding landscape flourishes with oak, beech and birch. The trail runs through mountain pastures, small forests and fields. From the top, Himakånå offers panoramic views of Lysevatnet lake, Nedstrandsfjord and farms surrounded by lush forests. Before or after Himakånå, head for the climbing park Høyt og Lavt, where all ages and abilities can safely test their climbing skills and challenge their fear of heights. You can also take a ferry to the traditional Ryfylke district, including the beautiful islands of Ombo and Sjernerøy. Or go to the Suldal area for salmon fishing and stay at the Energihotellet (the Energy Hotel) that was praised by Monocle magazine. If Norway had been designed by landscape architects, Preikestolen would have been an award-winning work of genius. No other mountain better sum up the thrilling beauty that is the hallmark of Norwegian nature. Such a famous trek creates high expectations. Is Preikestolen really that good? It might be sunny or rainy, windy or foggy - but that is part of the charm. Preikestolen’s character changes with the weather, the seasons and the time of day. You know when you approach the end of the steep trail through the birch forest: The landscape opens up and you sense the depth around Preikstolen’s surprisingly small plateau. You may have heard that Tom Cruise was here recently to shoot the next Mission Impossible – but more important than that is that you will bring home your own version of one of the most beautiful vantage points in the world. Make sure you read our safety tips before hiking to Preikestolen. Kjerag is the big brother of attractions. It is not just higher than Preikestolen, it also has a grand finale in Kjeragbolten: the large, round boulder stuck high up in the air in between two mountain sides. Nature must have been feeling playful when it wedged the boulder into the crack. Kjerag attracts the daring. Even though you can’t see the edge when you first arrive, you sense the abyss that awaits you. On a trek like this, it is OK to have butterflies in your stomach. Perhaps it’s the way it towers over the fjord? 1,000 meters of vertical granite does something to us humans. The word Kjerag gives BASE jumpers and rock climbers sweaty palms and dreamy eyes. Those who do not need such an extreme adrenaline rush may still feel compelled to step onto the boulder – an exercise that will expose a hidden fear of heights instantly. Kjerag is a demanding trip, with an unbelievable view offering memories for a lifetime. Do a bit of preparation in advance and make sure you have a safe hike to Kjerag. After Preikestoken and Kjerag, it might be time to give your legs a break. Make a trip to Stavanger, Fjord Norway’s centre for gourmet cuisine. It is a charming city with a wide range of restaurants, including two with Michelin stars. And don’t miss the beautiful sandy beaches of Jæren, located south of the city. Forget grand waterfalls and fjords - let yourself be amused by Trollpikken, a phallus-shaped rock formation that has become the most light-hearted symbol for the potency of Norwegian nature. The pride and joy of the Dalane district only made it on this list of iconic treks thanks to the efforts of volunteers and fund raising. In June 2017, somebody destroyed Trollpikken by cutting it off with heavy tools. The people of its home municipality Egersund worked hard to put it back in place with lifts, steel rods and epoxy. The landscape that surrounds Trollpikken resembles a scene from a Tolkien book with rolling hills, small mountains, rocks and shifting cloud cover. The Vikings also strode through the heather and granite of this area, where the last ice age carved out Trollpikken 10,000 years ago. Trollpikken is a great way to begin or end your iconic tour of southwestern Norway. Children of all ages can also enjoy a day of fun at the Kongeparken amusement park in Ålgård. A hike in the Norwegian mountains is not a walk in the park. Make sure that your body in general and your legs in particular are ready for this kind of slow-paced sightseeing. If you feel out of shape, a training program of eight weeks should be enough to make sure you can enjoy those awesome views. Focus on strengthening legs and buttocks with leg lifts, squats, and lunges. Train at an intensity level where you are able to keep a conversation while exercising – just remember to breathe too. Long, brisk walks will also boost your endurance and prepare you for lots of cool hikes in Norway. If you want to do all these iconic hikes, be prepared to spend around 11 hours of driving a distance of approximately 460 kilometres. See where the hikes are located on the map below. For a successful hike to Trolltunga, make sure you read this important safety information before you go. Preikestolen (The Pulpit Rock) towers 604 metres above the Lysefjord. Get essential safety tips before you set out on the hike to one of Norway’s most famous cliffs. Kjerag is the highest peak in the Lysefjord. Take a picture of the Kjeragbolten boulder, or enjoy the view from the mountain plateau – just make sure you stay safe. Pay attention to the weather and the avalanche warnings. Read the mountain code with supplementary comments. Head to Fjord Norway if you've got your mind set on classic hiking adventures like Preikestolen or Trolltunga. Hiking in the Norwegian mountains is a serious matter and can be challenging even for the fittest amongst us. To stay safe, it is important to be well prepared. Before you embark on a trekking adventure in the Norwegian wilderness, take a moment to ponder the practicalities. Be prepared, stay safe, and pack your backpack like a pro.